This summer, I've worn all the tanks in my shop NON-STOP. I literally just rotate them and wear this combination or this romper in between washings. 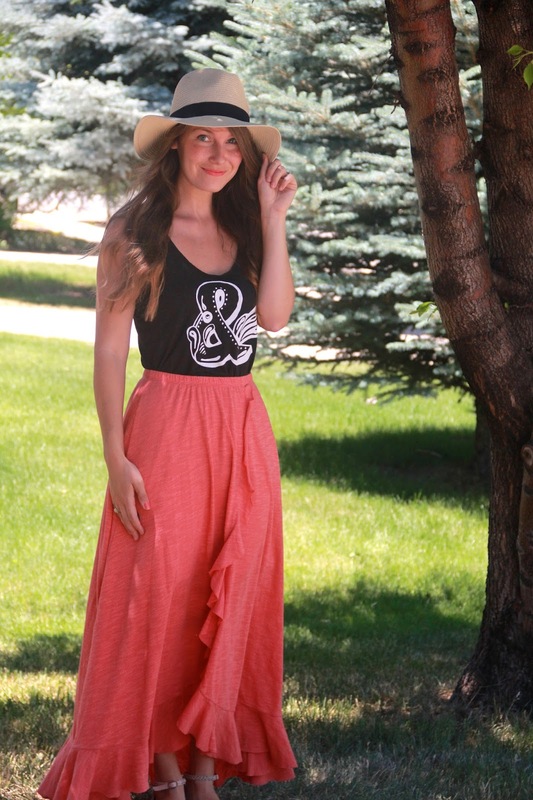 My favorite so far, has been pairing the kind of edgier charcoal ampersand tank with this flowy coral skirt. I love the contrast and this skirt has been my favorite for years. Paired with one of my own designs? Jackpot. Skirt - Free People. Similar/neutral version here. *sold out but you can sign up for restock notify or find similar ones here or same the exact ones are available here. That skirt - so gorgeous on you!! you are adorbs!! love your tank and all the things you are doing! have a great long weekend, friend! !